Narrowly focused, fast-paced 'young' feeling video could be used to introduce or reinforce the factors affecting the amount of ice on earth. Good overview of relationship between glacial mass temperature, sea level rise, and why people should care. Shows graphs of several data sets but did not include reference in video. 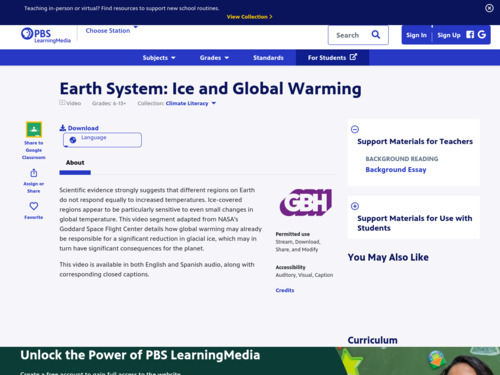 Comment from expert scientist: The video and background essay give information on the role that ice plays in climate. It describes the various factors that influence glacier mass balance and focuses on how warming temperature from rises in atmospheric CO2 are reducing the mass balance of glaciers. Videos are a nice way to engage students. Fast-paced video. Young-sounding narrator. Should keep students engaged. A background essay and discussion questions are supplied for teachers. Download video or play it from the site. Full screen image is a little on the fuzzy side.